Our laboratory solutions are regularly specified by architects and designers, and our prestigious client base includes Imperial College London, Salford University and Procter & Gamble, among many others. We apply the same level of experience and knowhow to our laboratory sinks as to all of our laboratory products – making them the ideal choice for your university, school, college, hospital or commercial laboratory. With our bespoke fabrication facility and attention to detail, we pride ourselves on creating high-quality items that will last for decades. We use only top-quality, 316-grade stainless steel for all of our laboratory products. This metal meets all current Health & Safety regulations, and is also supremely resistant to extremes of heat, and to contact with harsh chemicals. 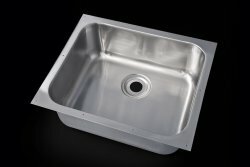 Where epoxy resin sinks have been known to crack under contact from certain chemicals, their steel equivalent will remain intact. In addition, the metal’s innate antibacterial properties resist the adhesion of bacteria, facilitating the maintenance of a bacteria-free environment – ideal for all laboratories, including a clean-room environment. The sheer durability of the steel means it will last for decades – making it the economically-sound choice for your project. Our laboratory sinks are made from 1.5mm-thick steel (many ‘off the shelf’ products are only 0.9mm thick by comparison), providing a strong, premium-quality sink, suitable for many lab applications. Choose from freestanding units, inset sinks and sit-on sinks – all designed to your exact specifications. We can also produce full lengths of stainless steel laboratory worktops with integral bowls in recessed anti-spill areas, where a standard sink configuration is not of sufficient size. 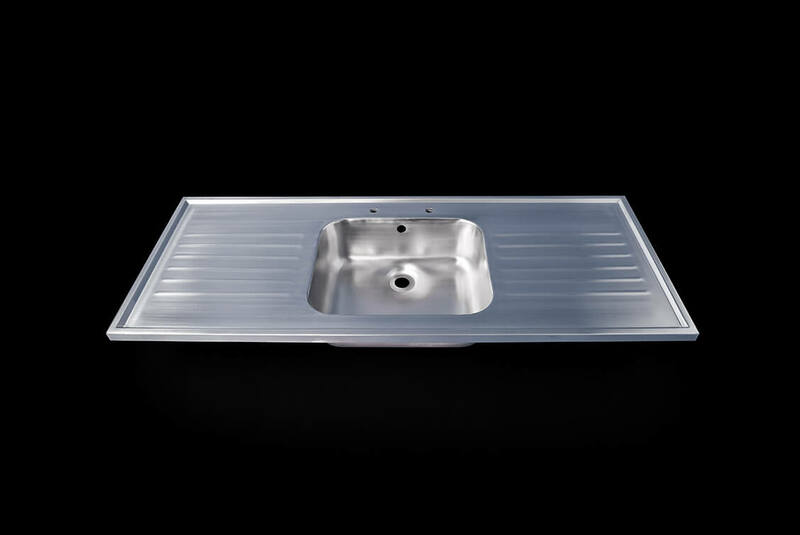 Take a look at the relevant section for more information on sinks for your sector. Unmatched for durability, our laboratory sinks are all made from the same bacteria-resistant steel as our entire laboratory range: this metal naturally resists the adhesion of bacteria, making it ideal for laboratory use, and even for a clean-room environment. 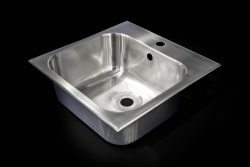 hether you need a stainless-steel inset sink, a sit-on sink or a freestanding unit, we can custom-make the required item to your precise specifications. 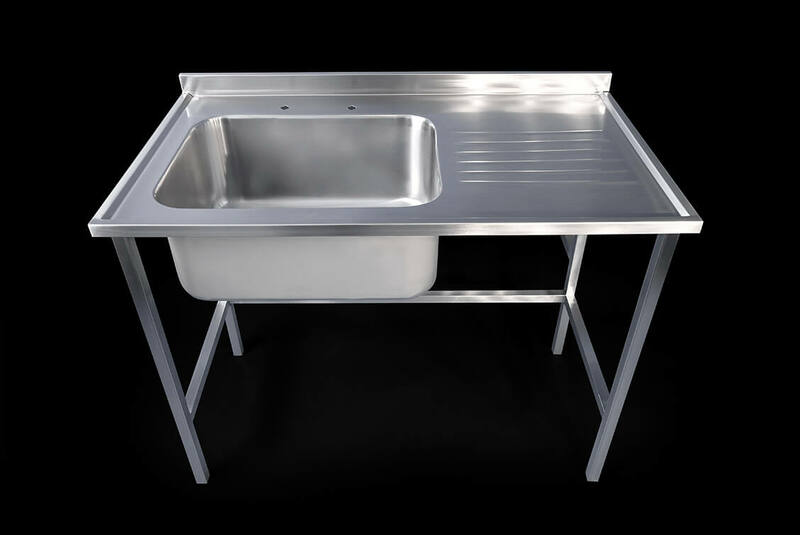 Fabricated from premium, 316 lab-specific stainless steel, our lab sinks are supremely resistant to impact, harsh chemicals and extremes of heat, and meet all current Health & Safety regulations. Inset sinks (also known as ‘drop-in’ sinks) are designed to fit into a cutout in a worktop made from any material. With integral water-retaining edging and adjustable worktop fixing clips, they can be fastened firmly to the bench top. Sit-on sinks are designed for mounting on to new or existing laboratory base units. They are supplied ready-bonded to a moisture-resistant MDF sub-frame, for added strength and impact resistance. This set-up allows for easy installation to the units below. Freestanding sinks are simple to slot in to any layout. They are also easy to relocate, should the lab layout change. Built on strong, fully-welded, frame-style legs, they can be fitted with under-sink storage, to make the most of space. All of our laboratory sinks can be made to any length and width, and can feature any configuration of sink bowls and drainers. Choose from our standard, prefabricated laboratory sink bowls (see table) or commission one or more of our bespoke bowls, available in a wide variety of sizes, up to 1800mm long and 500mm deep. The latter option allows you to specify the exact siting of taps and any waste/overflow holes. acid-resistant un-slotted polypropylene waste, with upstand waste and overflow tube. For the most streamlined laboratory set-up, choose a worktop that incorporates a fully-welded, integral sink. Our bench tops are made to order, from the same 316-grade steel as our bespoke sinks. We also fabricate stainless-steel fume cupboard liners, trough sinks, hand-wash basins and many other items for laboratory use. Contact us today, for more details about our products and services. Our laboratory sinks for hospitals and clinics are the most hygienic option on the market. Made from 316-grade steel, which is naturally antibacterial, they facilitate the maintenance of an ultra-hygienic environment. In addition, they are resistant to harsh chemicals, impact, and extremes of heat – and are durable enough to stand up to the stringent demands of a hospital or clinic laboratory, making them the ideal choice for your project. Choose from one of our range of prefabricated stainless-steel bowls (see table ), or opt for a fully-customised unit, with a bespoke bowl made to your specifications. Inset (or ‘drop-in’) sinks: fit into a cutout in a worktop made from any material. For the most hygienic option, combine your inset sink with one of our stainless-steel worktops – the welded end unit offers a seamless finish which is not possible with any other bench-top material. Sit-on sinks: bonded to a moisture-resistant MDF sub-frame, this style simply screws down on to existing base units. The sub-fame lends additional strength and impact resistance. Freestanding sinks: supplied on fully-welded, frame-style legs, these sinks are a good choice if you may be changing the layout of your laboratory at a later stage – or if you require a standalone unit, featuring built-under cupboards or shelving. We supply a full range of stainless-steel products for the healthcare arena, including hand-wash basins, wash troughs, vanity tops, shower trays, cupboards and shelving, all of which can be made to your exact specifications. Get in touch today, to discuss your requirements. The sheer durability of our laboratory sinks makes them the ideal choice for furnishing your academic laboratory. Fabricated from 316-grade, laboratory-specified stainless steel, our inset, sit-on and freestanding sink units are all super tough and will last for many years, making them the long-term, budget-friendly choice for your project. 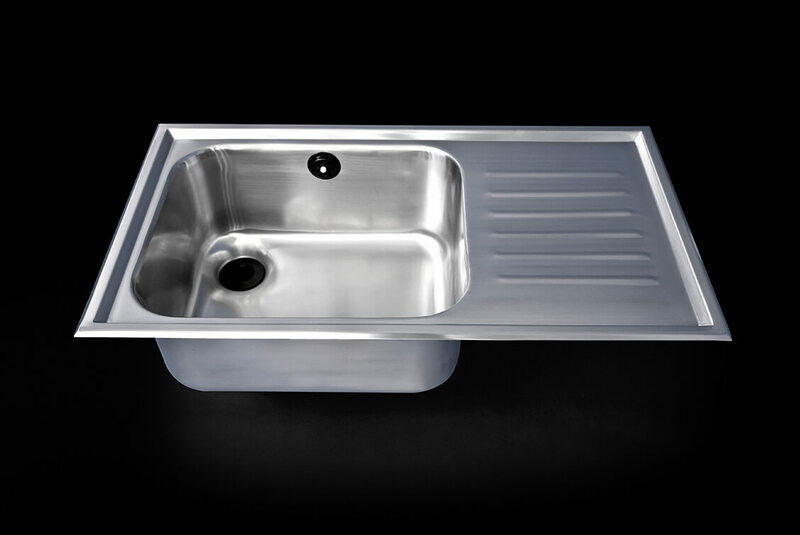 The steel itself is naturally antibacterial, helping to maintain a germ-free environment, whilst its robust surface is resistant to impact, heat and corrosive chemicals (by contrast, epoxy resin sinks have been known to crack under contact from certain chemicals). Our inset (also known as ‘drop-in) sink inserts neatly into a cutout in a worktop made from any material. Our sit-on sink is bonded to a sub-frame made from moisture-resistant MDF, which combines reinforcement and impact-resistance with ease of installation. Our freestanding sink is designed to be simple to slot in to any layout. It is also easy to reposition, should the lab layout change. Built on strong, fully-welded, frame-style legs, it can be fabricated with integral under-sink storage, to make the most of space. With more than fifty years’ experience of supplying stainless-steel products to the academic sector, DSM can fabricate any product, to the client’s exact specifications. From stainless-steel hand-wash basins, urinals and wash troughs to entire kitchens, we have the expertise to help furnish your project. Get in touch today, to discuss your requirements.